Ford is all set roll out the third generation Ford Focus for its customers but before doing that the company has revealed a sports variant of the Focus with a bunch of cosmetic changes incorporated as well as the car is equipped with a more powerful engine. 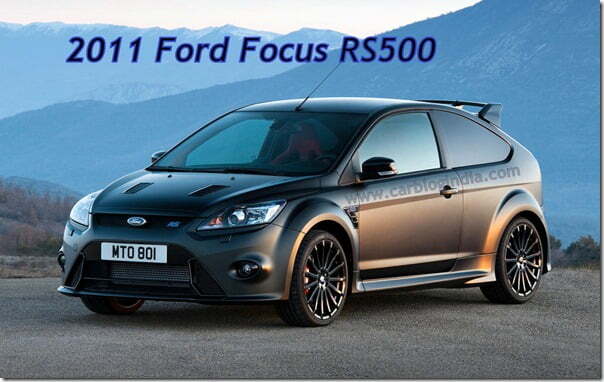 The Focus RS500 is almost a compact sports car like hatchback on display at the New York Auto Show 2010. 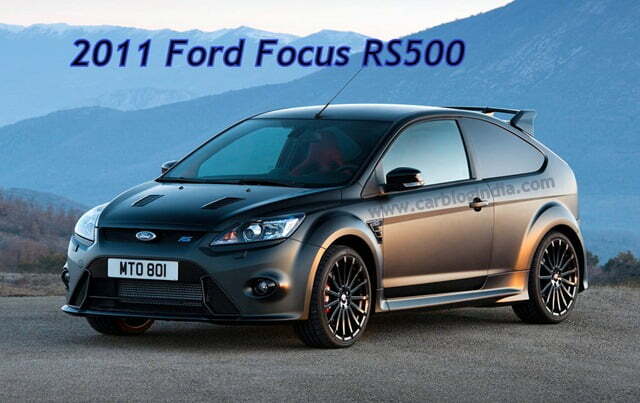 The Car is named as Ford Focus RS500 and is supposed to be a masterpiece if observed from the technical point of view, with its design platform derived from the earlier and potent Ford Focus RS. This Hatchback by Ford is considered to be the hottest among all with a more vibrant and appealing attire comprising of side skirts, spoilers, better and bigger alloys and a lot more. The RS features an engine which is a revised version of what comes installed with the Focus RS and could make anyone say “WOW” since this Volvo sourced heart is a 2.5-Litre Turbocharged one pumping a breathtaking 345BHP and a maximum torque of 440NM. And all the credit for tweaking the car in order to increase its power and torque(nearly 15% increase from the previous version) is to be given to UK based tuner Mountune. All these changes make the car touch the first 62MPH mark in 5.6 seconds along with an amazing top speed of 165MPH. Red stitching for the Leather on the Steering Wheel, Door Trims and Gearlever Gaiter making the car look brighter from inside. The car’s color will only be a Matt Black Foil finish one developed by American technology firm 3M specifically for this product and will make its global debut with the upcoming Leipzig Motor Show in Germany commencing from 9th of April and is expected to hit dealerships in UK late June end. The car is expected to be come under a price tag of approximately £34,000. I so want to test drive this one, wish to get behind the steering and feel the adrenaline rush on the acceleration and coroners.